In one of the libraries where I work (Merritt) there's a picture of its William Hamilton Merritt, one of those famous local historical types. In this book, he's simply known as "Hamilton," the main character's older brother. What's kind of cool is that the character, Susanna, is based on author Kit Pearson's great-great-great grandmother Susan Merritt, who actually was Hamilton's sister. This is my little foray into some local history, since I'm new to the area and know absolutely zippo about the War of 1812. A few weeks ago I went to Queenston and saw General Brock's memorial, but I was distracted by the canteen and mushroom-shaped fountain in the park. But I suppose that's neither here nor there. I do love to ramble. Overall, I haven't been too enthralled by the Dear Canada series, even though I love the idea of teaching young people about history through the made-up "diaries" of girls living in various times of Canadian history. The Newfoundland one I found boring and the Halifax explosion one was way too depressing. Still, all the books in the series get *rave* reviews from their intended demographic, so maybe I'm just being a jaded old librarian who's read too many of these historical kids' books before. 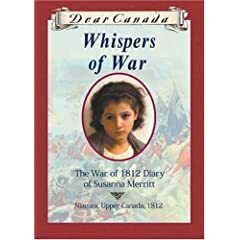 This book centres around Susanna Merritt, a twelve-year-old girl living in St. Catharines in the year 1812. Her father and older brother are involved in the war and Susanna records daily in her diary her fears for them, as well as the mundane parts of her life on a farm. Think Little House on the Prairie, Canadian style. My problem with this book, and of the Dear Canada series in general, is that is throws in too many "let's teach some history!" elements into the book. You just know the author was doing research and said, "hey! I learned how they made soap back then, so let's have Susanna make soap!" Sometimes the characters sound more like they're teaching history than being actual people. I also found Susanna's character to be somewhat bland. I never really felt like I got to know her.